There were plenty of numbers from the 2018 season that USC fans would just as soon forget, from a 5-7 record, to blowing 14-0 leads, to not having a single 1,000-yard rusher or receiver. But there might not be a number that carries more weight and defines the season more than 289. That would be the number of rushing yards allowed to UCLA running back Joshua Kelley, an incredible number at the time and something that becomes even more head-shaking each time it’s mentioned. 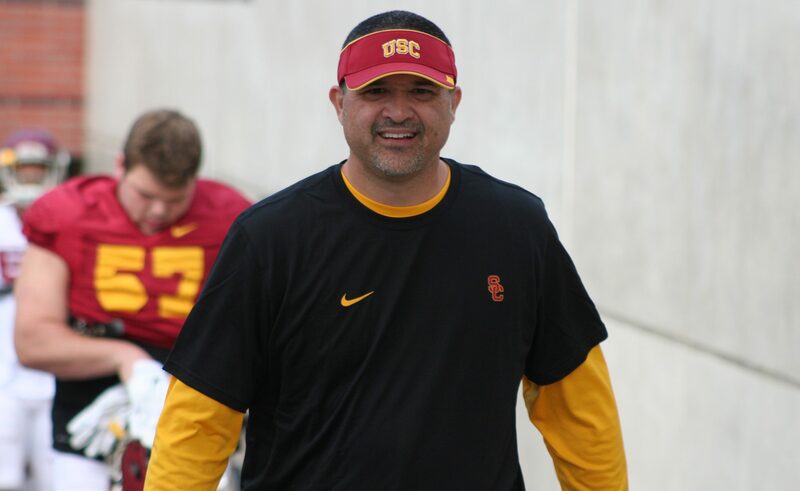 New defensive line coach Chad Kauha’aha’a (photo above) has a different number in mind for his group this spring. The idea of simplifying things offensively and defensively has been thrown around constantly this spring, by coaches and players alike. 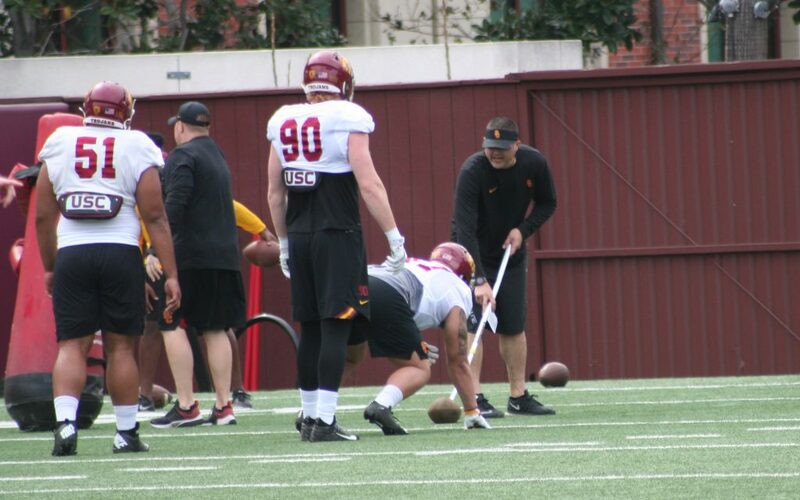 It’s the same along the defensive line, where Kauha’aha’a’s marching order from Pendergast and head coach Clay Helton were crystal clear, as he mentioned gap control and stopping the run as utmost priorities. After stance and technique, Kauha’aha’a said he preaches “playing through the numbers” to his defensive linemen, which means playing across the line of scrimmage rather than just on it. “And I have the dudes that can do it,” Kauha’aha’a said. Two of those dudes are Jay Tufele and Marlon Tuipulotu, who figured to be central figures in USC’s quest to play dominant run defense this season. Both have received consistent praise for their play through a handful of spring practices, and both were terrific in the live tackling portion of Thursday’s practice. Kauha’aha’a was effusive in his praise of Tufele. Like seemingly the rest of the positions with new coaches, the defensive linemen and Kauha’aha’a have clicked early. And though they all admit there is still plenty of road to travel, they like how far they’ve come already. USC allowed 164 rushing yards per game last year and ranked 67th nationally, which simply shouldn’t be the case with a group of players Kauha’aha’a said reminds him early on of having the potential to match the defensive line he had at Utah, which was filled with future NFL players. The line, with Tufele, Tuipulotu, and Brandon Pili anchoring the middle, along with strong early contributions from newcomers Drake Jackson and Nick Figueroa, should eventually be a strength for this team come fall. USC fans hope that means seeing a few numbers they can cheer this year, in terms of sacks and tackles for loss. It’s still early, but there’s definitely a positive feeling from players and coach.